The best part is that you do not have to fret about whether the weather will let you enjoy the Lankan beaches because if it is rainy on one coastline, the other side of the island is sure to boast perfect weather for beach enjoyment. Southwest monsoons make the east coast beaches such as Passikudah and Arugam Bay ideal for fun. The north east monsoons make the southern coastline such as Galle, Tangalle, Unawatuna, Hikkaduwa, Bentota and Mirissa perfect for a beach holiday. Starting from Arugam Bay, the eastern beaches stretch for about 275kms north along the coastline. Along this coast you will find wide stretches of sand and miles of clear, shallow water that is ideal for swimming. Deep natural harbours, still lagoons, pretty bays and coves, and beautiful underwater coral reefs are some of the major Sri Lanka tourist attractions along the south eastern beaches of Arugam Bay and Pasikudah. Trincomalee is a harbor port city located 250 kms from Colombo. At one time, Trincomalee harbor was an important destination for sea traders and has been visited by many travelers such as Marco Polo. 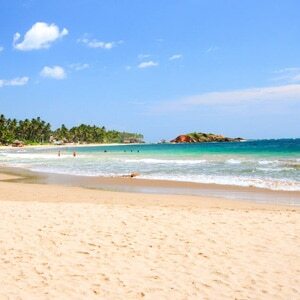 Uppuveli, Nilaveli, Marble Beach and the Dutch Bay are the famous beaches on the eastern coast of Trincomalee. While some of these beaches are more ideal for strolling and surfing, swimming is possible too. Scuba diving, fishing and whale watching are added activities that one can enjoy on these beaches. 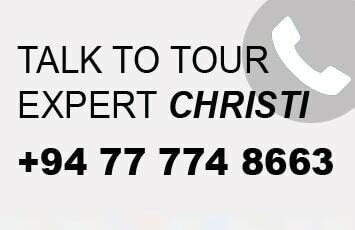 Located in close proximity to the Bandaranaike International Airport and just about 35kms north of the busy city of Colombo, is the city of Negombo, known for its sandy beaches and massive fishing industry. With hotels and restaurants to suit every budget, make Negombo a sure stop place to visit in Sri Lanka and enjoy the friendly life in Negombo while adoring the traditional canoes and wooden boats that go past the beaches every single day. 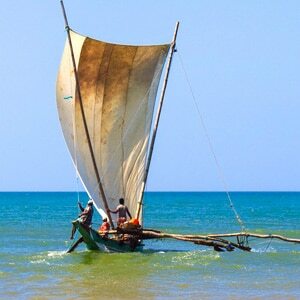 In Negombo you can also explore the remnants of the Dutch rule, enjoy some bird watching and meet the age old fisherman at daily fish auctions. About an hour’s drive from Negombo is the romantic beach of Chilaw that is popular for its crabs, coconuts, authentic Sri Lankan curry and its beautiful sea pearls. These are the popular southern coastal beaches that begin from Mt. Lavinia (suburbs of Colombo) and curve south along the coastline up to the city of Hambantota. The fastest route to get to the south from Colombo is the southern expressway that cuts down half the time taken when compared to the alternative Galle Road. The beaches in the southern coast are sandier than the western ones and do not drop deep into the sea, hence are ideal for indulging in swimming, snorkeling, surfing and other exciting water sports. In addition to the beaches, cities like Galle are popular Sri Lanka tourist attractions for their historical heritage. The drive along the southern coast also involves other activities such as batik factories, turtle hatcheries, stilt fishing, local temples and tasting fruits from the roadside. Also known as the “Gold Coast”, the south of Colombo not only boasts the best beaches but also has the most developed and top notch boutique hotels and resorts. Memorable beach holidays in Sri Lanka come with charming locations, state of the art accommodation, high quality service, and great food, all at reasonable rates. In addition to luxury and comfort with the five star amenities during your stay, you can experience adventure, nightlife and international cuisines. Adventurous water sports include canoeing, boating, sailing, snorkeling, deep sea fishing, deep sea diving, river cruises, whale watching, water gymnastics, water polo, banana boat riding and jet skiing.